How does the Royal Keratin Hair Treatment work? When it comes to keratin, tough is good. Its strong protective qualities improve the hair both inside and out. Our unique biopolymer ingredient is virtually a "liquid form of hair" that gently blends with the hair on your head. It brings to hair what it was lacking to begin with and what it has lost over the years. Is the hair dull dry and damaged? Is it curly, wavy, frizzy, overly voluminous or unmanageable? Application of our keratin treatment puts an end to all that. The smaller keratin molecules penetrate the hair cortex improving and repairing the quality of the hair from the inside. The added strength, elasticity and moisture result in the smooth, soft, shiny and straightened effect. The larger molecules coat the hair cuticle and take the environmental insults such as UV rays, smog, and smoke for your hair on the outside. Further damage to the hair shaft is prevented. Brazilian Keratin Treatment is a revolutionary hair straightening method that softens, smoothes, and dramatically straightens your hair! It does not require any strong chemicals, but rather employs a solution containing all-natural keratin to work with the hair cuticles and gently take its place inside your hair. BKT actually works best with damaged hair—in fact, the more damaged the hair, the longer it lasts! In general, though, the treatment usually lasts anywhere between two and four months. Because this is not a permanent treatment, as the keratin-based solution diminishes over time, your hair will return to its natural form. The hair, however, will stay soft, shiny and healthy looking. The more you receive the treatment, the healthier and more manageable the hair becomes. It will require less blow drying time, and flat iron results will be excellent in few minutes. Since you don't have to work with the thermal solutions much on your hair the overall damage will be prevented. if your hair is unruly, frizzy, or overly curly and you would like to have low maintenance, hassle-free hair that is shiny and straight, Brazilian Keratin Treatment is just the thing for you! This emerging category has people talking. Salons, manufacturers, clients, consumer press and bloggers are all abuzz: "Where are the opportunities? What are the concerns?" This first in a series of SALON TODAY special reports goes In Depth to get the info and answers you need to form your own opinions on the most current—and most controversial—topics impacting beauty and business. Spend a little time Googling "keratin services" or "Brazilian keratin treatment" and you'll find a dizzying amount of website postings. Sort through enough of them and you'll likely come to this conclusion: Consumers are interested in the service because it promises to make curly, frizzy and even damaged hair sleek, smooth and healthy looking. With service tickets averaging $300-$600, and reaching as high as $800, many salons want to meet this demand and offer keratin treatments. But they are unsure how and where to find credible facts, products and education. To add to the confusion, online surfers will find an assortment of strong claims, both positive and negative, with likely exaggerations on both sides. So where do you search next? If you are a salon owner interested in adding Brazilian-type keratin services to your menu, or if you have clients asking questions about it, you need to dig deeper. Gather facts and education from professional salon industry sources, then meet with your team to discuss what you learn. Controversy over chemical services and potential impact on clients and salon professionals is not new. In the '80s, salon profit smelled like perm solution, before shifting to a formula of semi-, demi- and permanent color. Powder and gel nails enhanced new service dollars, but also fresh concerns over fumes, exposure and ingredients. Eyelash tinting and extensions have raised eyebrows in recent years. Throughout it all, the professional beauty industry has advocated for the protection of its practitioners and their clients, but also for solid education, fair dialogue and a balanced presentation of the facts behind services that can help salons sustain and grow business. In 20 years of covering professional beauty, I cannot recall a single topic or product category generating such a strong—and strongly divided—response as this new, keratin-based chemical service. Some salons have added the service, and are thrilled with the new dollars and new clients. Others won't touch it—citing the formaldehyde, or more accurately, the cosmetic-grade formalin, that preserves the keratin on the cuticle. A few, including Graciela Santiler-Nowik of Chicago began researching the category when they first heard of it. She used what she learned as an opportunity to not only bring in new business, but also to upgrade her ventilation and staff safety procedures for all chemical services. The bottom line is there are multiple opinions and companies swirling about this new category. Insiders at America's Beauty Show (ABS) estimate 12 or more companies will exhibit the category at their event at the end of March. One of these, a leader in the segment, claims 6,000 salons across every U.S. state and 25 countries carry their line. 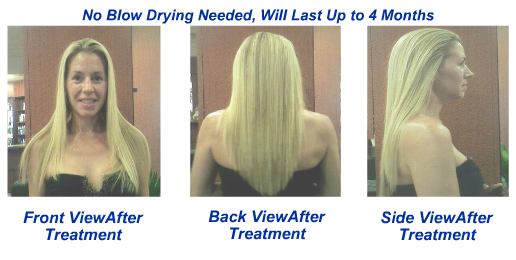 Ultimately, you need to understand keratin treatments. Follow-up at industry trade shows, contact peer salons you trust, and share your thoughts with SALON TODAY Editor Stacey Soble and me. Keratin treatments to smooth hair began in rural Brazil more than 10 years ago. Someone discovered that certain preservative chemicals seemed to link keratin to hair, resulting in frizz-free locks that lasted for months. This got the attention of Brazilian cosmetic manufacturers, who began testing and formulating. Researchers discovered that when the cuticle is open, the protein keratin can be introduced, along with cosmetic-grade formaldehyde, which is known to cross-link proteins in hair. Then, the cuticle is sealed with multiple-pass flatironing at 450 degrees. During the flatironing, the heat can cause fumes to be released. This step—the fumes—is the center of the keratin treatment confusion and controversy. According to Doug Schoon, a chemist and president of Schoon Scientific in Dana Point, California, any keratin treatment product that supposedly contains formaldehyde actually uses an ingredient called formalin. Formaldehyde is a gas and, as such, can't be a liquid, so could not be added as a cosmetic ingredient. Schoon explains that formalin is created when dry formaldehyde gas is reacted with water to create a new and different substance called methylene glycol. "Methylene glycol is a totally different chemical with completely different properties and characteristics," he says. "For years, this name mistake has been made around the world by scientists, doctors and regulators, until last December when formalin's name was officially changed in the International Nomenclature of Cosmetic Ingredients (INCI) dictionary." "When you heat formalin," Schoon adds, "it can convert back into the original form and release a small amount of formaldehyde gas in the air." Schoon is currently working with a manufacturer to measure the amount of formaldehyde fumes stylists may be exposed to when using flatirons with formalin-containing products. He says it's possible cosmetologists who perform service after service may be exposed to excessive levels, but very likely a source-capture ventilation system can reduce those levels, effectively removing the gas from the air before it's inhaled. Online postings about formaldehyde being an irritant and potential carcinogen are correct. It's associated with nasal and brain cancer, according to the National Cancer Institute. However, most posters aren't aware it's a gas released during some keratin treatments, and the FDA does not regulate the amount of formalin in cosmetics, making the discussions of "legal amounts" in bottles moot. Regulation occurs through the Occupational Safety and Health Administration (OSHA), which has strict guidelines for maximum allowable worker exposure to formaldehyde gas. Food and Drug Association (FDA) spokesperson, Suzan Curzan, e-mails: "The FDA doesn't have specific regulations that prohibit or restrict the use of formaldehyde [formalin] in cosmetic preparations, and is unaware of safety data indicating that Brazilian keratin products pose a health hazard to consumers, under the labeled conditions of use." That's why, for instance, the FDA takes no issue with nail hardeners containing up to 5-percent formalin. These products are more than a "coating," says Schoon. "Formalin is reactive to proteins and creates a chemical link or bridge with them." Like the second step of a perm process, keratin treatments with formalin don't break bonds in the hair, but do "fix" the keratin in place, semi-permanently. Whether ingredients other than formalin act identically is unclear. The success—and confusion—about Brazilian-style keratin products opened the door for a slew of "formalin-free" formulations, currently calling themselves "formaldehyde-free." But keratin alone cannot create the desired, long lasting, "frizz-busting" results. So the theory is that some "free" formulas simply use different chemical compounds. Chemists say they can't be sure if the "free" products create a potentially hazardous gas or not when heated, unless they test the surrounding air during use. Nine years ago, QOD Cosmetic, a dominant cosmetic firm in Brazil, was one of the first companies to create a professionally produced Brazilian keratin product. According to Niko Johnson, CEO of San Francisco-based QOD USA, under EU and international labeling standards, his brand could claim to be "free," but doesn't. "It's not that complicated to get other compounds to transform into formaldehyde," says Johnson. "They convert when you flatiron the hair. Any Brazilian-style keratin treatment product sold to stylists should require identical protocols and precautions, whether it's called 'free' or not." Use a compound that reacts in a similar manner when heated (this includes his brands). Contain keratin and incorporates flatironing, but has no chemicals similar to formalin, thus doesn't last very long. The lesson? Know which of the three types you have, because there can be huge differences in results and effects. Mark Garrison, who offers what he calls the "real deal" at his namesake Manhattan salon, says you need formalin to get the hair straight, and laments lack of transparency. "You need 450-degree irons for Brazilian keratin treatments to work," adds Garrison, whose stylists use canister masks and perform the service in a custom-ventilated area. Read BKT: In Depth, In the Salon for Graciela Santiler-Nowik's experience with providing keratin treatments. Omar Roth, co-owner of O Salon in Greenwich, Connecticut, worried about health effects and after due diligence, selected a "free" brand. "It removes about 70-percent of frizz and wave and doesn't last quite as long as the original formulas, but the results are still amazing," says Roth, whose former printing-plant salon space has industrial ventilation. "We do about eight treatments a week now." J.B. Veltman, who owns an eponymous salon in Coconut Grove, Florida, says some brands he tested lasted just until the next shampoo. He now educates for a company that openly shares the percent of formalin in the product. "I've been using it for years in a well-ventilated studio salon with a de-fumer at the station," says Veltman, who along with his clients, wears a mask during the treatment. "No matter which brand you use, the same precautions apply." If you're shopping for a keratin treatment line, common sense mandates working with a reputable distributor or manufacturer. Request and require a Materials Safety Data Sheet (MSDS) so you can read the hazards identification section. Ask your vendor about specific ingredients, then research them yourself in a cosmetics ingredients dictionary or online. Next, perform product tests in a well-ventilated area. Use gloves and a canister mask for formalin-containing product tests (particulate masks aren't effective with gases). Compare results to expectations. Call other salon-users to discuss pros and cons. Whether you choose a "free" brand or not, professionals stress appropriate ventilation, including a source-capture system—fans don't help a stylist three stations away. Use gloves and masks. Peter Garzone, owner and president of ProSalon distributorship in Cranston, Rhode Island, says an article in Allure initially made him happy he avoided keratin treatments. Now, he wishes he'd started distributing the formalin-based product he chose sooner. "If you're concerned, wear a passive air monitoring badge that measures formaldehyde in the air," says Garzone. "Ours tested at 0.25 parts per million." According to OSHA spokesperson Ted Fitzgerald, the maximum, permissible formaldehyde concentration in an atmosphere to which workers are exposed is 0.75 parts per million (ppm) over an eight-hour period—or 2 ppm for 15 minutes. What have they heard? Nearly two-thirds (65%) are familiar with the term keratin treatment or Brazilian keratin service. The other 35% were not. How/where did THEY hear about Brazilian Keratin Services? How many are offering it, and who is considering adding it? Another 29% say have done or plan to do research to explore the possibility of adding Brazilain keratin services to their salon menus. Another third (34%) say no, they are not offering it, and not currently exploring the idea of adding it. Are they aware of any controversy surrounding the service? 44% said yes, they knew there was some controversy regarding Brazilian keratin services. 56% (including 35% who had not heard of the service) were unaware of any challenges. As a matter of practice, all salons should have well-ventilated storage rooms and avoid placing cross-reactive chemicals near one another. Formalin can be explosive in the presence of hydrogen peroxide. Sodium chloride, salt and ammonia are all incompatible with formalin, which is why coloring the hair before formalin-based keratin treatments is recommended. "When you discuss the service with clients, talk about hair condition, lifestyle, expectations," says Denise Kingsley, a texture specialist who owns High Tech Hair in Denver. Because formalin-based keratin treatments do not break bonds, users say their true power is in transforming damaged, frizzy or wavy hair. Kingsley adds that it's not the best choice for healthy, super-curly African-American hair, but if that hair type has been previously relaxed or heavily colored—the more porous it is—the better the service will work and the longer it'll last. Another must-know: You can't use a shampoo that contains sodium chloride, which breaks down formalin-based chemical links and possibly others, reversing results. Hundreds if not thousands of high-end salons are offering keratin treatments because clients are clamoring for it. Many say the results it produces—a semi-permanent way to smooth wave and banish frizz—has become an irreplaceable business builder. Those who aren't ready to bring in the category, or refuse to do so, say they are sticking with alternate service options to cater to their clientele: from flatironing and blow outs to traditional relaxing and Japanese thermal straightening. The latter two break bonds and use chemicals that require their own precautions. Some manufacturers and salons are capitalizing on the questions surrounding formalin-based keratin products to promote these alternatives. The best advice from all industry and category experts is for salon owners to do their own homework. Make an informed business decision for your salon, your team, your clients. Evaluate and assess your ventilation system and safety procedures for all areas and services offered in the salon. Do what you need to do to protect the health of your business. What it is: A chemical process service to smooth curly, frizzy hair. Includes the application and absorption of a liquid solution throughout the hair. Heat (450 degree flatironing) is applied to activate, and seal keratin to the hair. What you can charge: The service can command up to $800; the average price ranges from $300 to $600, depending on length and density of hair. Time it takes: Most technicians complete the service within 90 minutes. Some salons have stylists "double up" to expedite the flatironing stage, depending on the length and texture. Permanent or temporary: Designed to be long-lasting without changing the physical structure of the hair. Fades over time with shampooing. How long it lasts: The straightening, frizz-reducing effects are estimated to last up to four months, depending on the client's hair texture, condition and home maintenance routine. Do: Perform color services before processing keratin treatments. Know that: Formalin, a cosmetic-grade solution of formaldehyde, is what binds and preserves the keratin (a protective protein) on the cuticle, and is what creates the long-lasting effect. Always: Ask your distributor or manufacturer for an MSDS on the product. Be suspicious of any product that does not plainly list its ingredients on the label. Insist: On training, education and proper ventilation systems. FOR STRAIGHTER RESULTS ON ALL HAIR TYPES INCLUDING THICKER OR CURLIER PROCESSED HAIR CHOOSE THE ROYAL TRADITIONAL KERATIN TREATMENT(WITH UNDER 2% FORMALIN). Formaldehyde is one of the most basic chemical compounds found in nature. It uses carbon (the building block of all life) as well as hydrogen and oxygen (what makes up our water). It's a naturally occurring compound that is used by a variety of animals, plants, and insects to sustain life. It is even made by our bodies during the metabolic process. Formaldehyde has been a source of food for simple life forms such as bacteria before man walked the planet. Nearly everything in the plant and animal kingdoms uses or creates a form of formaldehyde at various levels. Formaldehyde doesn't stay in any living body for extended periods of time so it doesn't accumulate. Did you know that every time you wash your hair, brush your teeth, or use toiletries you're using formaldehyde in some form? Formaldehyde is found in a large number of products because it makes them safer by protecting them against the growth of bacteria. You first encounter this during your science experience in high school where you dissect frogs or pigs. These dead animals are stored in a formaldehyde solution to keep them preserved and safe for students to work with. Formaldehyde has been routinely used for decades in hundreds of products. Some of them touch your body every day and you don't even know it. Nearly everything in the plant and animal kingdoms uses or creates a form of formaldehyde at various levels. Formaldehyde kills bacteria and improves your hygiene and subsequently your health. What's behind the Formaldehyde compound? The formaldehyde molecule is one of the most basic carbon compounds it is made out of a single carbon atom, two hydrogen atoms, and a single oxygen atom. Despite the fact that it is found everywhere, Formaldehyde does not accumulate in the environment or within plants, animals or people, as it puickly breaks down in the body and the atmosphere. Even animals readily metabolize formaldehyde using an enzyme called aldehyde dehydrogenase (ADH) which breaks it down. All organic life forms – bacteria, plants, fish, dogs and cats and humans – produce formaldehyde. The air we breathe contains 1 to 68 parts-per-billion of formaldehyde. Humans inhale it, exhale it and eat it in fruits and vegetables. In fact, the average person produces about 1.5 ounces of formaldehyde each day as part of normal metabolic processes. Formaldehyde exists all around us naturally. It degrades in the presence of sunlight to CO2 and H2O. Once again the choice is yours. Our Royal Keratin (Mild) Treatment for hair with a thin to medium thickness offers an alternative to a traditonal formaldehyde keratin conditioning treatment for those that would like sleeker,healthier, more manageable hair. Our Royal Keratin Traditional (with under 2% formaldehyde)Treatment for all hair types including thicker,wavier hair offers a conditioning treatment for those seeking a healthier, more manageable ,straighter look . Why is Formaldehyde used during the Traditional Keratin hair treatment? Formaldehyde is used to hold the keratin molecules together (this keeps your hair nice and straight). The more formalin used during the treatment, the longer your hair stays straight. Are there any alternatives to Formaldehyde based solutions? Yes. There are many types of keratin solutions that don't contain Formaldehyde. These solutions can contain aldehyde (a chemical similar to formaldehyde), or glucose based solutions using vinyl(sugar).